Sherwood Pines sits in Nottinghamshire, the fabled home of Robin Hood. Unfortunately, Robin Hood never slayed trails on a bike. Truth be told, if Robin Hood wanted to have shredded some gnar I think he would’ve got his merry men together and rode further afield in search of some altitude. Enough of the Robin Hood references, lets get down to it. Sherwood Pines is fairly easy to get to from our side. It’s pretty much straight down the motorway then a couple of A roads. It’s always easy to find parking and there’s always room to leave the car fairly close to the start of the trails and the cafe. Paying the £6 or £7 it costs for the day’s worth of parking seems a little steep to me, but it’s not really out of average for a Forestry Commission car park so I won’t quibble too much about that. Speaking of the cafe, it’s not bad. It serves hot food, has a decent selection of sandwiches and some indoor seating. It does seem to close somewhat early though. The last trip we made down there finished at sunset and, after some boggy off-piste, I was looking forward to a nice cup of coffee to perk me back up for the journey home. The cafe was shut. Thankfully, McDonalds rescued me on the way home. The trails themselves are average, in my opinion. Sherwood Pines is built on relatively flat ground with very little altitude to play with so what they have done with what they’ve got isn’t bad. It’s just not great either. In a similar fashion to Dalby Forest (which I reviewed here), I find that cross-country riders would be most pleased at Sherwood Pines. 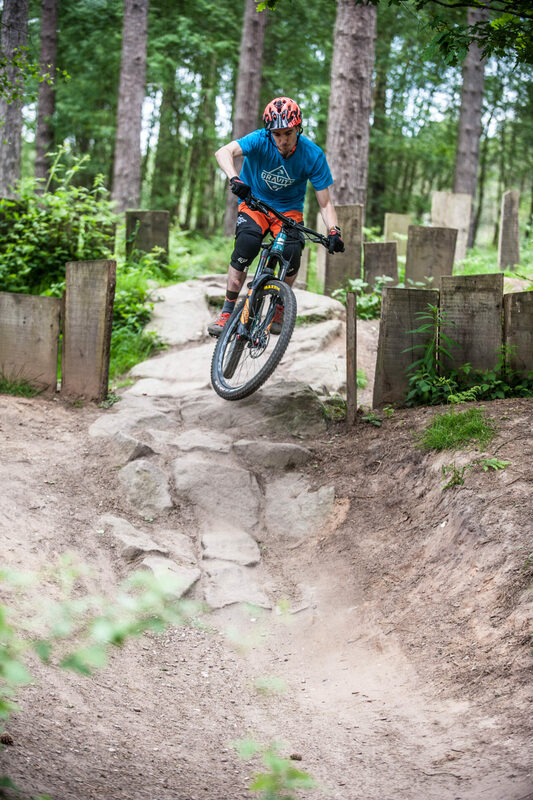 There’s a couple of good sections of trails that are fairly rewarding, but only if you’re prepared to put in what seems an endless amount of pedalling for not much of a reward. 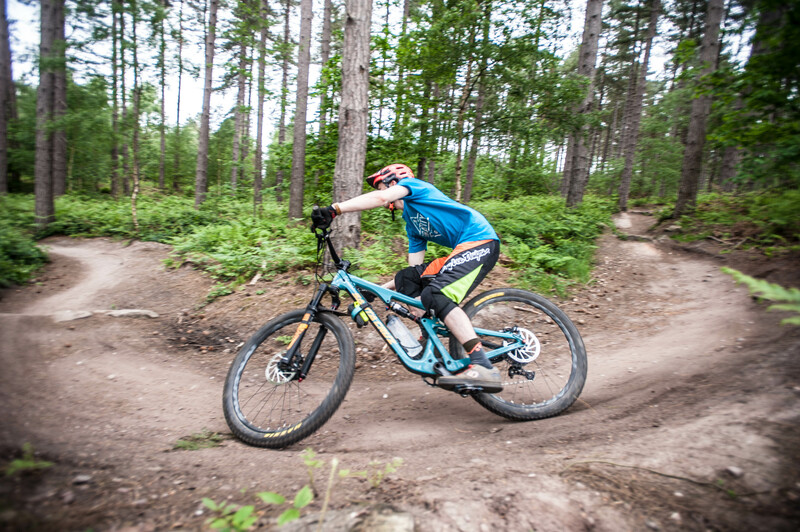 Sherwood Pines would make an excellent training ground for people working on their bike skills or general fitness. The ‘downhill trails’ found about halfway round the red route, or just off the blue, are well worth checking out whilst you’re there though. There’s a few different options peeling off from a central downhill channel which allows you to pick up the longest continuous descent of the day. Options to pop off some little lips and rocks are thrown in and it makes for the most interesting part of the ride each time I visit. Next to the downhill trails is the dirt jump park. Again, this is a super place for progression. At one end are some tiny jumps to get comfortable on and they progress all the way across to bigger tables, tables with dropped centres, gap jumps and end with some pretty big gaps. This is a huge highlight of the place for me; not because I want to jump my bike, but because it provides such a good place for progression of the skill. 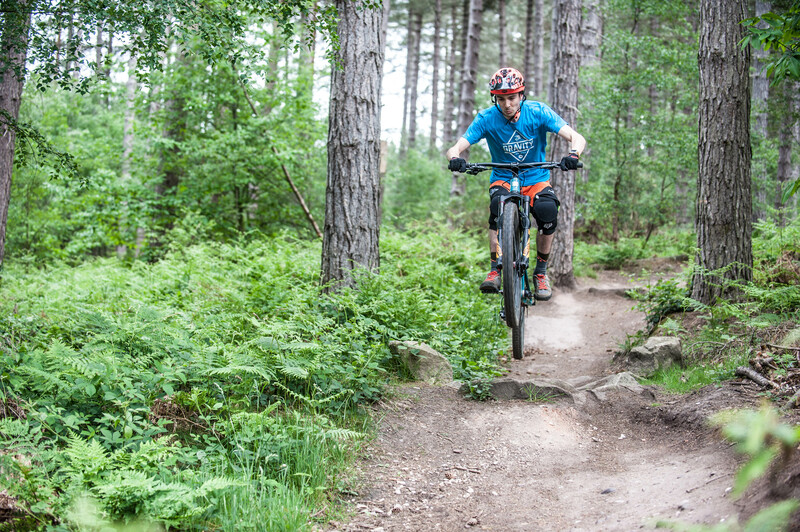 Aside from the marked trails, Sherwood Pines has a lot of unmarked, off-piste, opportunity for riding. From what I’ve seen, this is where the place comes into its own. There’s some absolute garbage, as there always is when people carve their own set of trails into a place, but there’s also some gems. A particular favourite of mine is a little place called ‘the trenches’ and ‘the skids’. They’re really good fun and are certainly something you don’t find at most other trail centres. All in, Sherwood Pines is a mixed bag. If you don’t mind pedalling virtually all the time, you can have a blast here. If, like me, you’d sooner be at the top of something, point your bike and let go, Pines might be worth missing… unless you can get hold of someone to show you some of the off-piste. Sums Pines up pretty succinctly mate. In fact, if it wasn’t for the NNS majority being up there, I’d never ride it again..the reward vs effort just isn’t there. Thanks man! Yeah, I agree. If it wasn’t for the folk who ride down there, I don’t think I’d have been back either. Although… the off piste is worth a play on if I had a bit of time.